Of all the noteworthy serials and evolutions that are carried out in a submarine, personnel transfers at sea by small boat or helicopter have the most potential to be as amusing as they are perilous. 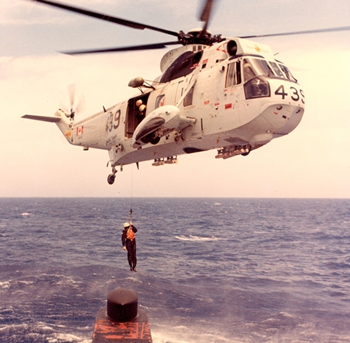 Early in her commission, at sea dived, we received an exclusive message that an admiral (no names no pack drill), from Maritime Command Headquarters, would be transferred to us by helicopter. There was a flurry of activity on board. Ojibwa would look her best. We carried out what is known as a Friday Routine. That is, she was thoroughly scrubbed and cleaned from top to bottom, inside of course, the corners were hucked out and all the brass and chrome was polished to perfection. We even tidied up our bodies and cleaned into proper clothing, (at sea we often wore what was favourably referred to as Pirate Rig, anything more comfortable or outrageous than the issued articles of regulation clothing). All was in order for an admiral's inspection. We made rendezvous with the helicopter, surfaced the boat and headed into the sea for the most comfortable course to carry out the transfer. The evolution would be carried out on forward casing between the fin and the accommodation space hatch well. 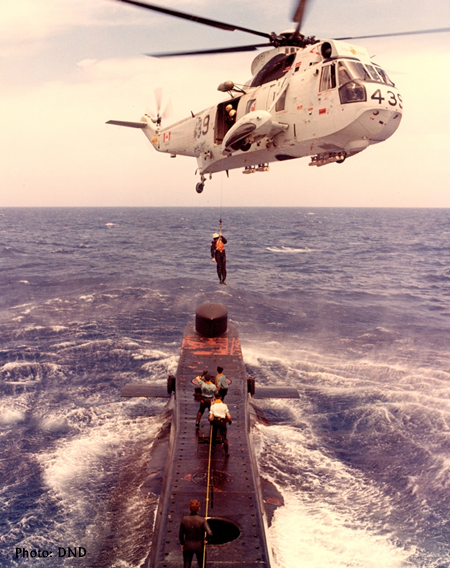 The Scratcher (Number One IC of the casing party) two badger, Leading Seaman Mike Chislette and I donned our inflatable life jackets over our cleanest submarine sweaters and made our way up and out onto the casing forward of the fin with our helo transfer gear in hand. The sea condition wasn't bad but there was a good swell running. We had not attained full buoyancy due to our intentions to dive as soon as our esteemed guest was on board and ushered below, so we were sitting lower than usual in the water. For additional safety, Mike and I stood down in the accommodation space hatch well facing aft in order to be able to observe that part of the casing where the Admiral would be lowered. We could also see the hand signal orders from the XO on the bridge. Once the Helicopter was overhead we would not be able to hear anything and we didn't have the luxury of wireless headsets way back then. The hatch well was about 3 ½ feet in diameter and 4 ½ feet deep with a short ladder fixed to the after wall to enable personnel to step down to the accommodation space hatch to gain access to the boat when we were alongside. We stood on the hatch lid that was only a few feet above water level and seldom opened at sea. The transfer scene was set. The helo pilot maneuvered his bird directly over top of us at about 40 to 50 foot altitude,…. so to speak. We were pitching up and down and rolling from side to side so he had to continually make corrections up down and sideways in the hover. The admiral was eased out and suspended on the winch wire. As they began to lower him I climbed up onto the casing with my grounding hook and stood with my feet a few inches apart and my heels at the edge of the well. Mike stepped up a rung on the ladder and wrapped his arms tightly around my ankles pressing down on my toes to keep my feet planted solidly on the casing. The bridge and casing were visible to him through my legs. We had successfully utilized this procedure several times in the past. Helicopters can build up a lot of static electricity in the air and it can be quite a jolt to be the conduit for it when it discharges to the boat. So we use a grounding hook to short out the cable directly to the boat. It is a long poll with a metal hook on the end and a length of wire with an alligator clamp that is attached to an effective grounding point on the casing. As the person is lowered to the casing I would reach up above his head with the grounding hook, short out the cable, and draw him gently toward me until his feet were on the deck. Mike would let go of my ankles at that point and come all the way up out of the well to assist me to unhook the horse collar and immediately guide him firmly to the fin door. Next time we would switch positions in the hatch well. As the admiral's feet grew closer I observed that his arc of swing was dramatically increasing with the pilots effort to maintain position. He began to circle my head. I actually had to duck a couple of times to avoid making contact with him before I could ground out the cable with my hook. I couldn't use the hook yet for fear that I would hit him with it. As the admiral swung and circled and twirled and bobbed all around me, I got a glimpse of a very frantic CO and XO hanging precariously over the edge of the fin, both making frenzied gestures for me to grab the admiral. So I dropped the hook and damn the static shock, the next time he swung by in front of me, his feet about three feet off the casing, I reached out and glommed on with a firm all round grasp of his hips. I got him from behind so my face was buried in the small of his back. (Just wanted to clarify that.) Just then the boat dropped into a trough away from the helicopter. The sudden strain on the cable lifted the admiral higher, me off my feet and Mike almost all the way out of the hatch well. Neither one of us were about to let go. Imagine the exhilarating sight. A totem pole of the three stooges with the CO and XO turning white and gasping in horror on the fin. We couldn't see the expression on the admiral's face but I'll bet it was quite spectacular for those who could. With Mike lifted almost clear of the accommodation space hatch well, I felt something snap and give way. All of a sudden I was sliding down the admiral's legs like a fireman on a pole,… with his pants and underwear in tow. Conveniently, his pants and underwear bunched up around his ankles and prevented me from sliding right off the end. The Helo pilot corrected down. The sea pitched us up. And we all wound up in a heap on the casing. I was trying to get the admiral to stand up straight and give me some slack so I could unhook the horse collar and he was fighting me all the way trying to bend over to pull up his pants. Orders from the bridge had deteriorated to a mix of violent undecipherable flailing arms and hands and hysterically sputtered verbal commands that we couldn't hear over the prop wash anyway. Mike wasn't being much help either. He was pretty much useless, curled up in stitches trying to wipe the tears from his eyes. And to make matters worse it was quite cold that day, so the admiral's introductory 'appearance' on board was not as outstanding as one might attribute to the enormity of an admiral's rank. Eventually, probably about 5 seconds that felt like an hour to the CO and XO and the admiral, we had the admiral unhooked with his pants up and were leading him to the fin door. As we were helping him to climb up into the fin we observed that his belt buckle was broken and his pants had split up the back. The helo had backed off far now enough so that we could hear him huffing and puffing and muttering sounds of discontent unbecoming of a flag rank officer as he climbed the ladder to the bridge, one hand holding onto his trollies. Mike and I gathered our safety gear, climbed into the fin and shut and clipped the door. Once we could control our levity we asked for permission to carry on below. The reply was a very clear and resounding "NEGATIVE, STANDBY PERSONNEL TRANSFER, FORWARD CASING". "STAND DOWN THE CASING PARTY" from the bridge. Fifteen minutes later we were back in our comfort zone at 120 feet and the CO was busy writing the visit report. That must have been an interesting piece of work. The entire visit lasted less than 10 minutes. Although the admiral never once made eye contact with me, it was still an honour for this mere Able Seaman to meet him and most definitely my closest contact ever with an officer of that seniority. That evolution taught me a couple of very valuable lessons that served me well for the rest of my career. The measure of a man has nothing to do with the breadth of the braid on his sleeve. And if you ever insist on taking yourself too seriously, don't expose your shortcomings. I was never again in absolute awe of an admiral. Some people have a gift for expressing the sentiments of many in an individual manner. Former Chief Petty Officer First Class Jim ‘Lucky’ Gordon has done just that in a series of stories and articles for the Museum of Naval History. We think you will find that Jim has a great sense of humour but never forgets the importance of the real tasks at hand. Submariners are real men doing very real jobs in incredible circumstances. Don’t let his wry humour lead you to label him a joker; he retired in 1997 as Feet Chief Petty Officer Maritime Forces Atlantic and his long and dedicated service to Canada has been acknowledged with the Medal of Military Merit. Lucky’s faithful four-legged companion Jock crossed the bar in 2015, but he continues to hold the post of honorary mascot to HMCS Ojibwa in her new role.